Can you believe it's been a year since the disaster in the Bangladesh garment factory that took over 1100 lives? As we reach this anniversary, many of us sustainable fashion advocates can't help but ask ourselves if anything has really changed. On the one hand, fast fashion appears to still rule the day. H&M and Uniqlo have both recently opened their first stores in Australia, and Zara's Australian profits outrank sales in other countries. And judging by the number of times I hear phrases such as, "Oh this top? I got it for only $20! ", I know that cheap, fast fashion isn't going anywhere, well, fast. On the other hand, there have been quiet rumblings of hope. . . if you read certain blogs and magazines, or hang out in certain pop-up retailers and cafes, there is a definite fashion revolution underway. Little by little, considered-purchase by considered-purchase, the tide is turning . . .
More often than not this revolution starts with looking at your clothing's labeling, and pondering questions of materials and country of manufacture. And it grows with each conversation you have about an interesting local designer producing clothing here in Australia, or a label producing in a fair trade factory in India. And it's all culminating in this week's Fashion Revolution Day, 24 April 2014. 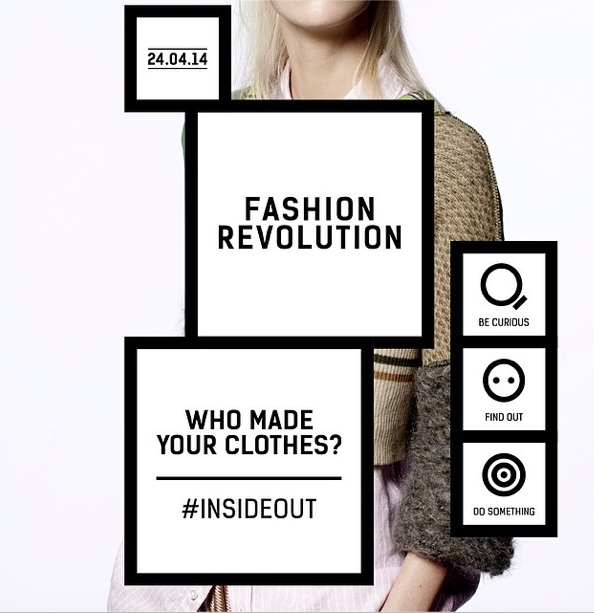 On 24 April, we're all asked to wear our clothes #InsideOut, see what's on the labels of our clothing, and start asking questions about the truth behind our labels. Whether you have on a designer dress, your favourite Zara number or that top you love but you have no idea who made it - turn it #InsideOut and learn a little bit more about what you love to wear. And don't stress too much if you learn it wasn't made ethically; instead ask that favourite designer of yours to start changing their practices. That's when we'll really start to make a change.